A friend and one-time colleague reminded me of the above saying recently. Since then I have repeated it roughly ten times a day. Kristy is ready to kill me, but she knows that it is true. It’ss simple, but it’ss helping us be more deliberate. 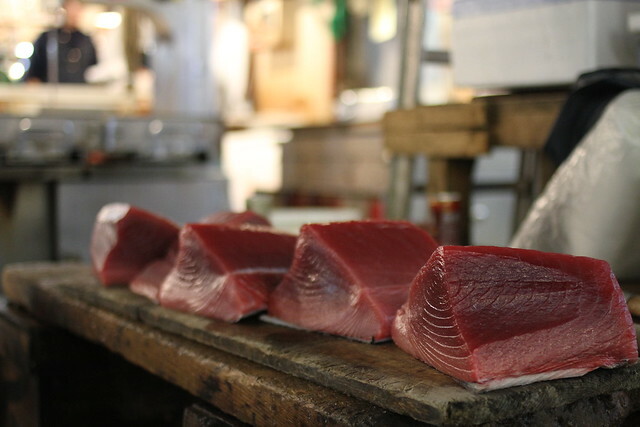 I snapped the photo at the Tuskiji Fish Market in Tokyo. You need to get up before the sun, but visiting the market is so worth it. One of the things that I took away was the coexistence of activity and serenity. It’ss a busy place. If you are not careful one of the tuna laden motorized carts will take you out. At the same time there were moments of calm control; vignettes of a long developed craft being carefully exercised. The photo above was one of those moments. Off to the side there were more enormous fish waiting their turn. It looked like a mountain of work. Nonetheless, the monger planned each cut and executed it methodically. His expression didn’st change. He never saw me, even though I was 6 feet away. It was so slow and so smooth. I doubt he makes mistakes. I doubt he wastes time. First, making popcorn. We have had four people report that they received a box with something missing inside. That’ss terrible. Not only did we ruin their moment, we also need to ship replacements. Shipping is slow, expensive, and painful. We are now methodical when packing boxes. There are no more screw ups. This has to be the most literal expression of slow is smooth, smooth is fast. Second, day to day activities. Kristy and I are running flat tack. It’ss easy to drop a ball and we do now and then. These little mistakes, like say, forgetting to respond to a magazine’ss request for samples, are time consuming and costly. Every time I read a story of a startup that made it, there is a least one big, “Thank god we didn’st agree to that.” or a, “If we hadn’st started that conversation, we never would have…” These important decision points will arrive without warning. They will at first look like just another email, conversation, store, whatever. If we are going too fast we will miss it. Third, our markets. We have received tons of requests from markets across the US. We look each one up to learn about it. It’ss fun. These are really cool stores, and we so badly want to see our popcorn there. We have to say no. It’ss so hard. It feels wrong every time, but we have to focus on our region first. Lean, improve, and build our brand before selling is new markets. Slow and smooth. The post is coming out of a small, quiet, and yellow hotel room in Minneapolis. I’sm here doing some really cool design, but working full time in addition to Quinn Popcorn is a real challenge. If we are going to keep up, if we are going to catch the opportunities as they attempt to flutter past, slow, smooth, and fast is the only way. Oh, right, one more photo of the glorious tuna.